The aperture-fed waveguide horn antenna is a common antenna that is widely used in systems which require a high efficiency directive antenna. This antenna is built nearly identically to the pin-fed waveguide horn antenna, except for the fact that it is not fed via a coaxial connector. This type of antenna is built by means of flaring the front of an open ended waveguide, this flare takes on the shaped of a horn. This horn shape directs radio waves into a high gain beam of energy. Horn antennas are widely used to as feeder antennas which often feed a parabolic dish increasing the gain of the total system. A horn antenna is commonly used as a universal standard for calibration and gain measurements, these types of horns are often referred to as standard gain horns. Equations for determining the parameters below are found at the end of this article. A well designed pyramidal horn antenna can have a peak gain between 9 and 18dBi, with some horns having as much as 25dBi of gain. The gain of horn antennas often increases as the frequency of operation is increased, this is due to the electrical length of the horn increasing as frequency is increased. Horns are considered to have a directional patterns. The radiation pattern of a horn antenna depends on the angle and as well as the final opening size & , this inherently affects & (note that ). If these parameters are properly optimized the performance of the horn can be optimized. Often these parameters are considered to be properly optimized if maximum gain is met in the shortest possible aperture length. The bandwidth of a horn antenna is limited only by the frequency range of the waveguide selected. Each and every waveguide has a specific cutoff frequency. If the feed is not analyzed, the standard pyramidal horn works well over a sufficient bandwidth (typically greater than 40% bandwidth). 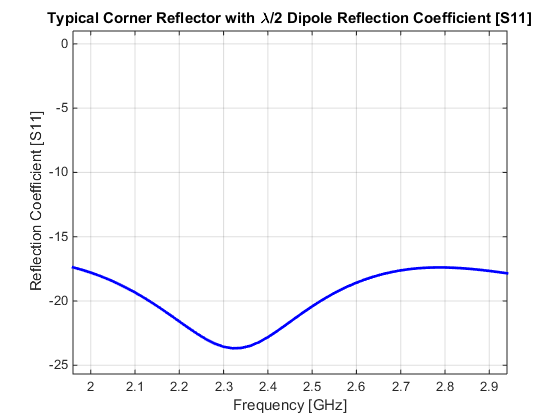 The cutoff frequency of the waveguide selected should be less than the operating frequency of the antenna. Once a waveguide is selected the equations below can be used to design the final pyramidal horn. These values can now be used to determine how much the horn should be flared. Most often it is optimal to optimize for a needed gain, in other words what is the smallest size the horn can be for a specific gain. To optimize the horn for size while achieving maximum gain the parameters , , , ,and must be found. Antenna, Antenna A-Z, Horn Antenna, Pyramidal Horn. Bookmark.